How can we create a better pet air travel experience? This project was designed in collaboration with Michael Kenny and Dayoung Hong. My team contribution included product ideation, product sketches, 3D modeling/rendering,detail work for the physical prototype, and documentation. Pet it and for-jet it. The world is your oyster and you know it. You love to jet-set and you love your pet; you are officially a pet-setter. Taking your small dog on a plane trip can be dangerous, and makes your pet nervous, anxious, and uncomfortable. You may pay the bills, but your pet is our real customer. We strive to appeal to your pooch’s point of view; creating Pavlovian responses through branded graphics, sounds, and smells. Our focus is to create the an amazing under-the-seat experience for your best friend. People spend about $60 Billion per year on their pets, and more people than ever are taking their pooches onto planes. To accommodate, airlines and airports are offering more options and amenities. This includes JFK airport’s new $48 million pet-exclusive terminal, and American Airlines first-class canine cabins. However, as much as we like to travel with our best friends, flying is stressful for pets. From separation anxiety to fear of the dark, there are several reasons flying isn’t fun for your pet. These anxieties result in disruptive behavior that can transfer that stress to you and other passengers. At Woofly, we believe that flying with your pet doesn’t have to be painful. As a matter of fact, we think it can be downright fun. With our movement established, we each created collage boards that visually described the target audience, mood, look, materiality, and feel of our brand. From each of these mood boards we generated a vocabulary set that described common themes found within each of the boards. What we discovered was a shared belief that this brand should be fun, playful, bold, and modern. Using this list of adjectives as design principles, we developed color palettes, chose typography, and started developing the brand voice. These exercises helped us to delineate our brand values and establish our brand pyramid. From this point we started sketching and imagining products that our brand would offer. After much discussion and prototyping, we realized that many of our solutions could be combined to create a one-of-a-kind pet carrier system. With this in mind, we started to sketch and build models to bring our experience to life. Combining copy, graphics, and product design we established the Woofly story, and finalized our offering. 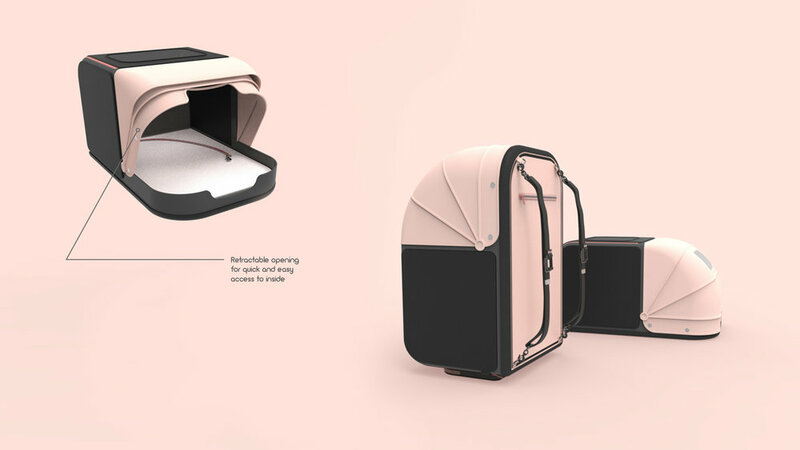 With interchangeable panels that are designed to relieve your pet’s anxiety, Woofly is the only travel carrier that is created for your pooch’s point of view. The Woofly pet carrier allows you to change out the side panels which are designed to address your pets specific travel anxieties. From toy organizers, to puzzle toys, to light panels, and an iPhone panel, Woofly has everything you need to keep your pet safe, secure, and feeling happy.